Today I realized I had some bananas in the fruit bowl getting overly ripe, so I decided to do a little baking. 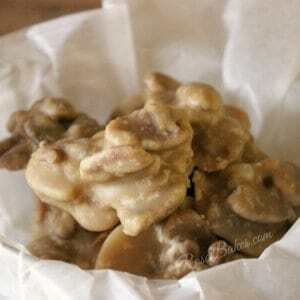 I started with this recipe, but tweeked it quite a bit and made it my own! Here’s what I got. Sour Cream Banana Muffins. This post was originally shared in April of 2012… I’ve been doing lots of behind the scenes blog work and decided to update some old posts with better pictures! I’ll have something new and fabulous up for you tomorrow if all goes well! 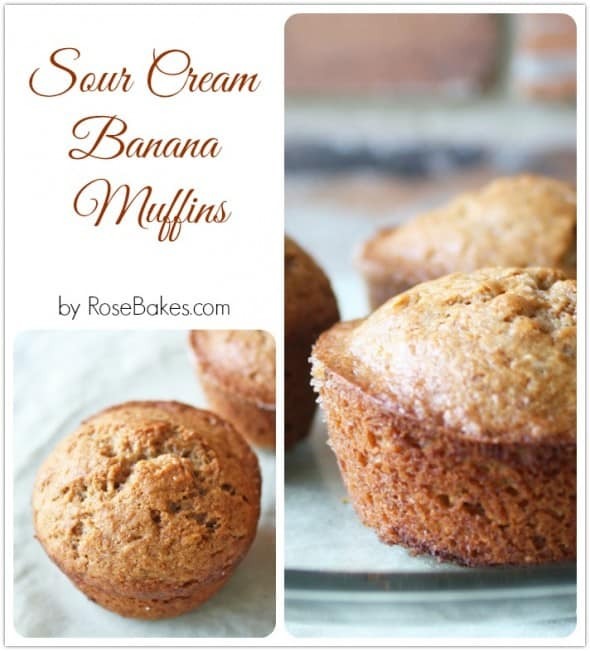 Now… on with the Sour Cream Banana Muffins…. Honestly, I’m not a big fan of banana-flavored things. I like a fresh (not overly ripe) banana every now and then, but I generally have zero interest in banana bread, banana pie, banana candy, banana smoothie, etc. If you put a banana in a recipe – I probably don’t want any of it. BUT – I do like these muffins. Especially hot out of the oven with a big slather of butter. Yum, yum, yum!! We will be having them for breakfast in the morning if they last that long!! And my kids love them for snacks too! These are moist and soft and perfect for any time of day. Although it’s spring right now, I really love to have these warm out of the oven in the Fall… they’re so comforting! 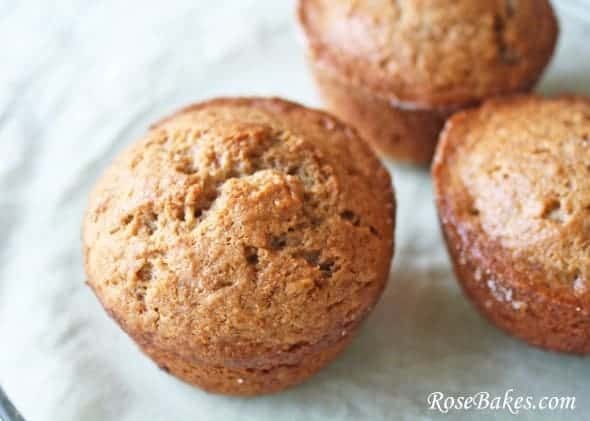 Note: I bake these in a silicone muffin pan with no liners, but you could easily use a regular muffin pan and/or liners! 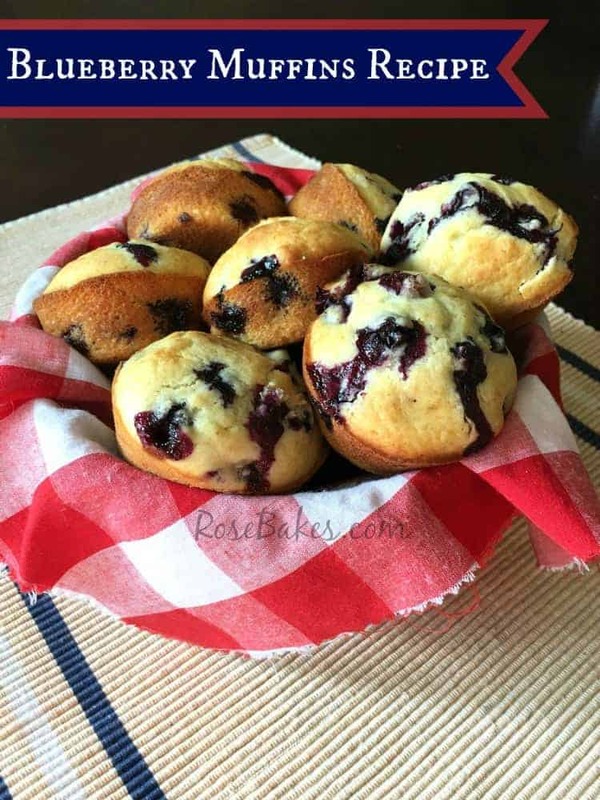 Moist and delicious muffins perfect for breakfast or a snack! Preheat oven to 325°F. Spray muffin pans with non-stick cooking spray (I used butter flavored) and dust with sugar and cinnamon. In a large bowl, cream butter and 1 1/2 cups sugar. Mix in eggs, mashed bananas, sour cream, vanilla and cinnamon. In a separate bowl, whisk together the salt, baking soda and flours. Combine the wet and dry ingredients and mix well. Scoop into muffin pans (about 2/3 full). Bake for 25 minutes. Makes 2 dozen muffins! Enjoy! Yum! Can't wait for these to come out of the oven. Thanks! 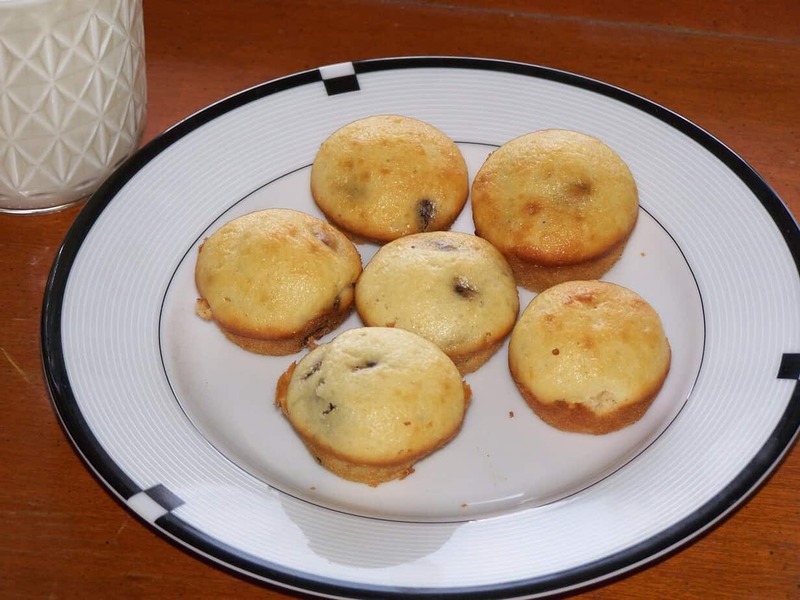 Kristen – I didn’t mention this in the post… but I don’t eat banana anything – I only make these to use up ripe bananas and because the kids and Richy love them!! This is one thing I could bake all day and not touch… ha! Have you made banana frosting? If so… wanna do a guest post? @Elizabeth – I’ve never made a banana frosting… my friend Kristen (the comment above yours) might have… I’ll ask her and let you know! It’s funny! My hubby bought me some silicone cupcake holders a while back to bake with. Never used them sadly, but with your new recipe….gonna give them a try!! Like how your muffins looked baked evenly!!! Thanks for sharing Rose!! Those look so good. Thanks for sharing at the Sunday Round Up. 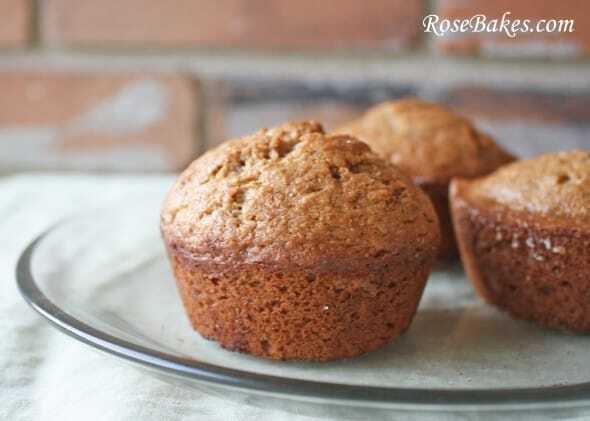 Hai….can if I dont use the wheat flour..only use all purpose flour only because my place its hard to find the wheat flour..please let me know because I love the muffin but dont know how to do it. thank you. I haven’t baked with white flour but I’m confident it would work! Thank you for your fast reply. Can I have a copy of simple butter cake… all in cups please. For your information, my country is Malaysia – Kuala Lumpur is the capital town. Thank you. I love making banana bread and muffins, but this sounds like a great alternative way with the sour cream. Never would have thought, and I ALWAYS have sour cream around the house. Thanks for sharing, found you at Share It One More Time link party. 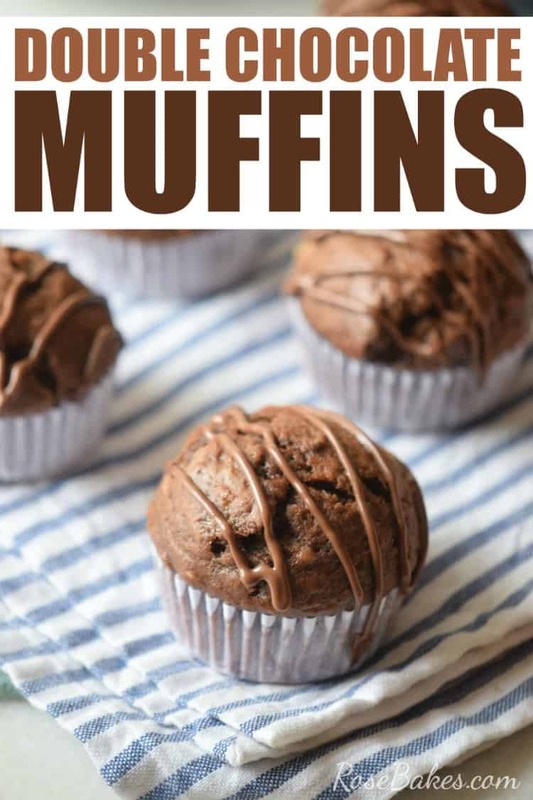 My grandma used to make muffins similar to this and these look just as amazing! Thanks for linking up with Delicious Dishes Recipe Party! These look super delicious. I’m already a huge fan of almost anything that has bananas in it.